How Much Do Educators Earn in the US? There are more than 3.5 million teachers working in public and private elementary, middle, and high schools throughout the United States. Their goals are the same—instruct students in a variety of subjects and help them apply those concepts—but the average teacher salary varies significantly from state to state. Those who become teachers do so to share their knowledge with children and ultimately prepare them for careers or college. They do not do it for the money. However, everyone needs money to live. While teachers, in general, make less money than others with the same education (at least a bachelor's degree and usually a master's), those working in some states earn considerably less than those employed in others. For example, in New York, which has the highest average salaries, elementary school teachers average earnings are $80,540, middle school teachers earn an average salary of $80,940, and high school teachers' average earnings are $83,360 (2017). Contrast this with Oklahoma, the state with the lowest average teacher salaries. 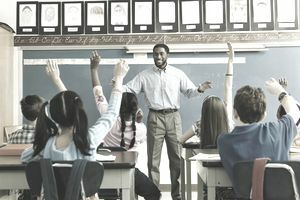 Elementary school teachers there earn an average salary of $40,530, middle school educators average earnings are $42,040, and those working in secondary schools make $41,880. The disparity in teacher's salaries has nothing to do with their job duties—teachers working in New York State have the same ones as those educating students in Oklahoma. They have similar schedules as well. Teachers spend about seven hours in the classroom each day from Monday through Friday. They also meet with parents before and after school hours. Teachers spend time outside the classroom, including evenings and weekends, preparing lesson plans and classroom activities. Traditionally, in schools that are open 10 months a year, teachers get eight weeks of summer vacation, as well as a couple of weeks off for winter and spring breaks. Those who work in schools that are open year-round usually work for nine weeks at a time with three weeks off between sessions. Teachers who work in states where salaries are lower have even bigger battles to fight. The per pupil expenditures are usually insufficient there as well, according to an article in USA Today (Frolich, Thomas C. Teacher Pay: States Where Educators Are Paid the Most and Least. USA Today. May 16, 2018). Lack of resources in their schools and classrooms make their jobs that much more difficult and is a leading cause of stress among teachers. They face challenges such as larger classes and a lack of up-to-date educational tools such as textbooks and classroom technology. Many teachers who work in schools with limited funding spend a portion of their own salary to buy classroom supplies. There have been several news stories—brought to light during the 2018 teacher protests for better pay and school funding that took place around the country including in West Virginia, Arizona, North Carolina, Kentucky, and Oklahoma—about teachers having to work multiple jobs to make ends meet. After spending their days in the classroom, many spend their nights working in jobs that don't require their professional expertise. Others leave the profession entirely. Some find other careers that take advantage of their education degree. Others retrain for unrelated occupations. There are side hustles teachers can do that take advantage of their training. They include working at summer camps, tutoring, selling worksheets, lesson plans, or other materials they developed for their classrooms; creating curriculum for publishers; proctoring exams like the SAT or ACT; and teaching adult education classes. Those in districts that offer summer school programs can also earn extra money by signing up to work during that time.